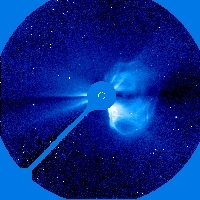 LASCO C3 image of a large coronal mass ejection (CME) of 20 April 1998. The dark disk blocks the Sun so that the LASCO instrument can observe the structures of the corona in visible light. The white circle represents the size and position of the Sun.